With much excitement and a little nervousness here’s my first recipe. Most people make new year resolutions and the most commonest one is to become healthy, get healthier or lose some weight. Whatever the resolution might be, I thought starting on a healthy note is befitting. This salad recipe has been tried and tested numerous times and is very popular in our family. Salads should always appear colourful to the eye, must taste sweet, tangy, crunchy and a wee bit chilli or pungent.The combination of sweet beetroot with a tangy orange becomes a very flavourful, refreshing and a filling salad. I have it often as a light meal. The serving is for 2 if it’s served along with a main meal or for 1 if you want to have it as a light meal. I try and cut the onion slivers as thin as possible as I don’t like the overpowering taste of the thick slices. Grate the orange rind and keep aside. Peel the orange and cut into chunks or thin slices. Peel and boil the beetroot. Cut into chunks or thin slices. Peel the onion and cut into thin slivers. Wash and dry the lettuce leaves. Tear into pieces. Put the orange, beetroot, onion and lettuce into a bowl. Make the dressing by adding salt, pepper,orange and lemon juice and orange rind to the olive oil. Whisk it well. Drizzle it over the salad and serve. Instead of lettuce can use any mixed salad leaves or baby spinach leaves. Store the extra grated rind in the freezer. Can use it for desserts, other salads or for baking. Those living in the western countries you may use the ready boiled beetroot available in the stores. I find it easier to peel the orange rind with a peeler. Then it becomes easier to remove the white skin and then slice it with a sharp knife. This sounds scrummy. I'm excited about this blog… maybe I'll do as Julie did!!? Hey Shreena thanks. Yeah keep checking, you may like some of the recipes. And believe me if you're going to follow my recipes it will be pretty easy. Poor Julie had to deal with a duck, lobster and what not. a little bit of orange goes a long way in a salad I think. Your creation looks lovely and summery – just perfect for outdoor eating! A perfectly light salad for healthy dinner. This recipe looks so lovely and colourful. Perfect for summer . What a perfect way to enjoy all healthy veg and fruits! Great for warmer days! 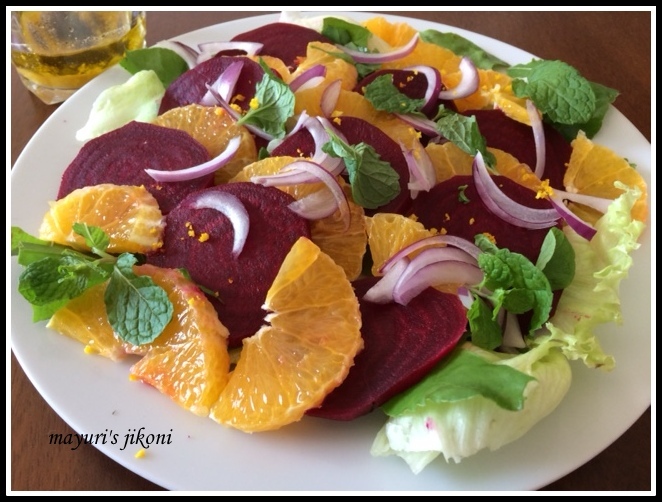 This beet orange salad looks so refreshing and colorful. My first recipe on the blog was a salad too. Nice salad and you have come a long way since then. Well done. First recipe in the blog is always close to our heart. The salad looks fresh and delicious. That's true Afroz and its one of my favorite salad. Nandita it is definitely tasty… the sweetness from the beetroot and the tanginess from the oranges makes a good combination. Thanks you Sapana. I've yet to go through your whole blog, but will do so slowly. Thanks Jagruti, I love to add both veggies and fruits to my salads. Thanks Nayna… do try it. its delicious. Yes it is Avin… I'm sure you'll enjoy it. Beetroot and orange combo sounds unique and refreshing!!! Just imagining the sweet and sour flavour of the salad itself i am drooling!!! Lovely share…. Thank you so much Geetha… try it. It is a burst of colors and flavours. Thank you so much Sasmita.